You are here: Home / Family Living / Parenting / Do Kids REALLY Need Speech Therapy? So, I started this blog “Baby Boomer Rants”, because I have a few very definite complaints, gripes, rants, whatever you want to call them. They are mostly about raising children. I guess because I look at how differently people are raising their kids than when I raised mine. I told you I have 4 kids, and only 1 is left at home. I don’t think I know it all, but, I have been there and done that – so what I have to say has some value, right? Today, I want to rant about speech therapy. Ok, before you get upset with me, I TOTALLY think there are kids who benefit from it, and it is definitely a needed service. However, I DO NOT think every kid needs speech therapy and right now I see parents being pushed left and right from Doctors and friends to have their kids tested to see if they need speech therapy. I am shocked at how many people have taken their kids for speech therapy and how many think their kids need it! I had 4 kids, and if they were young today – I would have been pushed to have at least 2 of them in speech therapy. One stuttered when he was 5… but, I KNEW it was only when he was over-excited and he needed to stop and take a breath and start again. I also knew he’d grow out of it, and in about 6 months, he did. In the last year, 2 close friends have been told by Doctors and friends that their children needed speech therapy because they weren’t talking enough. They were both around 2 years old. I told both Moms that I thought their kids were fine (unsolicited advice ). Both of their children are thinkers and you can just “see the wheels turning in their heads”. Now, many months later they are both talking and developing just fine. But, in both cases the parents were made to feel if they didn’t get the therapy (neither continued the therapy after 1 visit) that they were neglecting their child. From my experience in raising kids, working in daycare centers and just generally being very involved with kids over the years, kids they talk when they are ready (again, I know some DO need speech therapy). I have seen some wait until they could speak in complete sentences and just bust out talking one day. I have seen some kids talk at 9 months and some not for a few years. It’s the same with walking, my daughter walked at 9 months and I had one son who waited until he was almost 14 months. They are all different and develop at different speeds. Don’t compare your kids to others or worry about other kids their age so much. Don’t be pushed into anything by friends, parents or Doctors. I have seen parents become unsure of themselves and their role as a parent because they are comparing their kids, or someone says something offhanded that makes them worry about their parenting skills. You know your kids, you live with them 24-7, no one knows them like you do. Parent with your gut. I have always told expectant moms “You’ll get a ton of advice – even from me – take what you like and throw out the rest.”, that’s the best advice I can give. They are your kids, and ultimately it’s your responsibility, don’t let others try and dictate how you take care of your kids. I am not a Doctor and anything I say here should not be taken as medical advice. I’m almost scared to ask, but, what are your thoughts ? Hi! 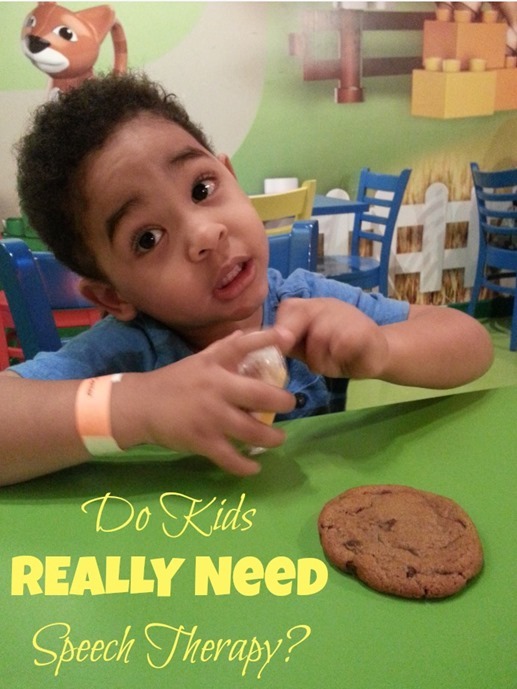 I am a speech therapist and do agree that kids develop differently and at their own pace. However, the developmental milestones are there to give parents and doctors a reference guide of where most typically developing children are in relation to speech and hearing development. I’ve actually had the opposite experience in that sometimes physicians do not refer kids when they need to do so. Early intervention is key in those that do need treatment. Your SLP will not “pick up” a child for therapy if it’s not needed. Speech therapy is as much for the parents knowledge as it is to help the children. Strategies are frequently given to moms and dads to help them encourage more communication in their children. Many times this can be done without the need for therapy and is very effective. Thanks for commenting! I know there’s a need, and I am NOT disrespecting your field, for sure! there’s just too much. I was in a Facebook group of about 50 Moms recently and 1 mentioned that her 2 year old might need speech therapy and about 30 out of that 50 said their kids had speech therapy. This was just a Mom bloggers group, I find it REALLY hard to believe that 30 Moms out of 50 had been told there children (and in some cases multiple children) needed speech therapy. I don’t know if it’s Doctors being afraid of missing something and being sued by a parent, I am not sure why this is such a huge deal now, when it wasn’t 20 years ago. I often find, as well, that parents are being scared in to it. I don’t know what the answer is, but, in my opinion, as a Mom of 4 grown children, it’s a little over the top – maybe it also relates to “helicopter” parents, I don’t know. But, I want to make clear, I am not a Doctor, or speech therapist and I totally respect both. Thank you!!! I feel the same way. My third daughter doesn’t talk clearly, and you know it doesn’t bother me. The doctor wanted her to go to therapy, but I don’t want to take her and since I’m her mother and I know how she is why should I? My first born was talking at 15 months old just as she didn’t walk till she was 15 months old. My second born started talking at 18 months but started walking the day before her 1st birthday. However the last baby is 3 now and sure she doesn’t speak clearly but after a couple of guesses or her showing me we figure out what she says. She didn’t walk till she was 18 months old, she surprised us by just getting up one day and walking like she had been doing it for months. I feel that when she is ready to talk she will wake up and just do it. Now once she is older, like 5, and still having problems then yes I will have her in therapy, but she is 3 and she needs to be a toddler not a mini grown person, if you know what I mean. I am so glad that there is another mother that feels the same way. Thank you!!! I completely agree! You’re very welcome! I do worry that earlier and earlier we are pushing kids to do more and more. This is the kind of homespun advice I took to Heart and waited to have my child seen by professionals. NEVER advise a parent of a child with developmental delays NOT to see a professional for evaluation. Your opinion may be right but it also may be wrong… and for that child and family the results may not be harmless. Seeing a specialist does no harm. My best advice to you is keep your mouth shut and just be supportive. I am sorry to hear that happened to you. I totally agree that Speech Therapy has a place. In my personal opinion not all kids need it, and as I said I am not a Doctor, just a Mom who raised 4 kids, and nothing I say should be construed as medical advice. I am a mother of a son who needs therapy. He has CP and is three, he doesn’t talk and they also work with speaking devices and helping him learn how to chew food. He is one of the kids that does really need it. I agree that some doctors may send other to early but I also think early intervention is the best. What if it’s just something they will grow out of or what if it’s not? I personally would feel better getting help sooner when it’s most important and prime learning time. I had my son in speech therapy 1 year before we even got his diagnosis and I’m very thankful I did. Of course I know I’m an extreme case who has a child who truly needs it but unless a doctor can tell the future I did understand why they would want a parent to seek help early incase. Just my thoughts as a mama but each mom knows there childrens different needs. ** also not talking can be a sign of other issues. For some and not others. I’m not that special needs mom that thinks every child who can talk has CP but other needs children may have could effect speech like hearing issues, autism, or whatever. Thankfully not all kids who go really do need it and will be fine but for the parents that learn more about a need or helps a child who does I’m thankful for the doctors who send them just incase. Thanks for sharing your thoughts so openly. I definitely agree with you that kids develop at their own rate. They do the milestones when they are good and ready. I also know there are children who really do need the speech therapy. My son is almost three and he still is not talking! He has a vocabulary of about three words. He is starting speech therapy next week. I waited and waited for him to start to speak, but I ended up going with my gut and getting him tested when he would not try to mimic sounds. He gets so incredibly frustrated when we can not understand him, or understand his nonverbal communication. Breaks my heart every time! I am very happy we are finally getting the help he needs. There really is no better advice than to follow your gut when it comes to your kids! My second daughter could have benefited from speech therapy. She reached 7 years old still unable to pronounce her g’s and k’s and because I homeschooled, there were no resources available for me in our community. I found it very difficult to find information on how I could work with her to improve her ability to pronounce these sounds – you would think in this internet age there would be something!! I worked with her very gently, speaking the correct sound into her ear when she was reading aloud to me (so she would be able to discern the correct sound) and practicing making “throat noises” to strengthen the connection. One day it clicked and she was able to do it and three years later one does not hear any impediment to her pronunciation. I often go back to “What would Laura Ingalls do?” since we have not always had the professional intervention options we do now and in a minor case like my daughter’s, working with her one on one as a parent was a good decision. I do think that parents don’t read to and speak with their young children (toddlers/preschoolers/babies) the way they should – this face to face engagement is critical in speech development, and maybe that’s why speech issues are diagnosed so frequently now. You make very good points. It reminded me of when I was 10 and my Mother told me I was pigoen toed… she explained that I needed to walk with my feet facing out straight. I spent a long time working very hard on it, and now there’s no sign I ever was. It’s my theory that we head to the “professional” too soon when there are many things we can do ourselves. THANK YOU! I am an occupational therapist and while it may seem “odd” that I don’t think EVERY child needs therapy….I TOTALLY GET IT! More and more we are receiving referrals for kiddos who have just some tiny “querks” or behaviors and instead of parents just being parents, they think they need a therapist to “fix” their child. Children aren’t meant to be fixed:) I LOVE sharing my experiences with families but we shell out way too many responsibilities on therapies for unnecessary things. Thank you for your insight. I definitely agree that parents need to be parents. It’s so easy to just hand them to someone else to “fix”. I agree that speech problems are over diagnosed for all the reasons you said and also because of muscle and brain development at different times/speed. Also, once your child begins they don’t recommend that they discontinue…children wouldn’t have perfect speech even at 7 , 8 years old or much older. I believe Children really benefitted from growing freely on their own timetable in the generations past. Moms, Don’t put so much pressure on your kids! When children begin speech therapy in public school, they develop a specific IEP for each child according to their needs. It is designed to help the child get OFF therapy. One of my children will only have two years–she has had such improvement it is no longer needed. My second youngest, however, is barely intelligible in kindergarten, so she needs more time. For the author of the article: From my experience, if a preschool child is progressing with speech, it doesn’t matter so much if their milestones are exactly in line with their peers. However, if no progression is being made, then there IS an issue that needs attention from a professional. Once they are school age, I can’t see anything wrong with a few minutes here and there to do the speech games. By the way, I ALSO have 4 children. Their father needed speech therapy as a child, and now so do some of our children. Just because a lot of the moms you know in one group online have kids with speech therapy doesn’t mean anything is systemically wrong across the board. Thanks for sharing – I have seen a lot of new Moms being “bullied” into it by their peers and society, not just one group of online Moms. I don’t want my post to be construed as me thinking that there is no need for speech therapy for kids, of course there are some who need it. But, I see Moms pressuring other Moms into it because their kid needed it. My point is not ALL kids need it, and it’s ok to rely on your instincts as a Mom and not be pressured into doing something because others think you’re being neglectful if you don’t. I agree with you also. Kid develop different. I have a r year old that was counting at 13 months talking in full sentences at 18 no th s and is currently reading at a 3rd to 4th grade level. But my 2 year old is a whole different story. He says about 15 words clear and certain sounds doesn’t pronounce but we do flash cards with him and he has the ability to say them and clearly but is lazy when he is talking and skips sounds. We will give him a little extra time within reason and make sure there are no underlying issues. His doctors agreed that especially since he has an older sibling that tends to speak for and before him waiting is a good choice. But every child has a different situation and now 5 weeks before I have my 3rd I am already wondering what he will be like. Congrats on your 3rd. They are all different, but, yet the same, too! Thanks for your comments, I totally agree! My daughter was almost two and barely said anything. She would babble and try to talk, but no words came out. Glad I started therapy, because it was a total developmental therapist who noticed my daughter’s quirk of sitting on different sides of her or moving to the other side of her depending on what they were doing. She realized my daughter had hearing problems when all the other doctors, including a neurologist, didn’t. She’s unilaterally deaf. She’s been in speech therapy ever since and now is quite the chatterbox. The neurologist thought she was autistic, and labeled her that, and never checked her hearing. Blanket statements, qualified by, “I know some kids need it” and, “I’m not a doctor”, basically means, nothing. Sometimes, it’s the therapist, who work with the kids more than a doctor does, that finds the answer. Thanks for sharing your experience. I am so happy that you found a therapist who was so attentive. I am happy for you and your daughter! My youngest is 2.5 and is currently in ST. He is our fourth son, and my oldest are 11,13&15. Things have changes a lot since they were little, and I’m not sure whether it’s pressure from society(social media) or just new studies that more and more parents are recommended ST for their children, and also I have noticed a lot of kids being diagnosed with autism or on the spectrum, being one explanation for their speech delay. As I was saying, my oldest 3 were never seen as having a speech delay, so when our youngest wasn’t saying but a couple words by the time he was 2, I decided to get a referral for ST. He is slowly progressing, and I have been so stressed out lately about it. I have almost considered stopping the therapy and just continuing teaching him at my own pace at home. I keep reading conflicting things about speech delay that doesn’t help either lol. One minute I read how behind a child can get if he/she isn’t saying a certain amount of words by a certain age, the next I read how kids are all different, they will talk when they are ready. I guess I’m still trying to figure out where my son fits in. It’s so frustrating. Sorry for the long rant/comment lol, just had this on my mind and came across your post. I totally get it, and things HAVE changed. I feel like there’s soooo much more saying they have these milestones they have to pass by certain ages or they need “help”. But, not too many years ago we were told – all kids are different they progress at their own stage – DON’T Compare. That’s huge the Dr.’s and books ALWAYS said DON’T Compare. I have a friend who was concerned about her middle son as he watched everyone and everything and didn’t talk, somewhere after 3 he began to talk – in complete sentences… his personality was a perfectionist. He wanted to do everything the right way – I think that caused his delay. They say that their personality is formed by the age of 2, so, I also feel personality has a lot to do with it. Older kids have a lot to do with it, too. My younger boys took their time talking because their chatty older sister did all the talking for them, she asked for what she said they wanted for them! lol So, they didn’t feel the need to do it for themselves. Believe me I do agree there is a need. But, I do think it’s being overstated now and I feel young Mothers are almost being frightened into doing it and it’s a hassle and time consuming and another expense… and I KNOW that not all kids have a certain number of words by a certain time and they develop just as they should on their own time frame. But, then the question becomes yours…. when DO you worry, when DO you decide? That’s the issue, should you be pushed by Dr.’s or societal pressures? Or do you know your child? Were you given all you need to know when they need something like this? I believe so, if outside issues and pressures were removed we would see clearly if there was a problem or not. Then again how do you do that? You see another kid crawling earlier, walking earlier, talking earlier and you wonder if yours will or if something is wrong. That is pretty instinctual. You have other kids, trust yourself and your Mom judgement. Don’t let people or things get in your head. These are your children, you know them and interact with them better than anyone. Follow your “gut”, whichever way it leads is right for you and your children. Then ignore all the noise surrounding your decisions. Take the pressure off you and lean into your own Mothering instincts. I hope in some small way I was able to help. I totally understand where you are and where you are coming from and I do believe it will all work out for the best whatever you choose.